When Aleena was first diagnosed on April 24, 2004, our whole lives changed. We did not initially think about donating her tissue, because we were too busy trying to save her. Her four-year journey with medulloblastoma was, as any cancer family knows, a rollercoaster ride, a life of constant up and downs. The next turn was never predictable. After Aleena’s surgery, we donated the originally resected tumor tissue. Later, when she had her shunt tapped, we asked that the fluid be used for research, because it was so full of cancer cells. How else would researchers be able to get these cells, and from a living person no less? When Aleena’s journey started to come to a close we took the steps necessary to make sure everything was in place. We made all the arrangements for DNR status, her funeral, and even for donation of autopsy tissue. In doing so, we wanted to make sure that her life, which meant so much while she lived it here on earth, would continue to mean something after she left. 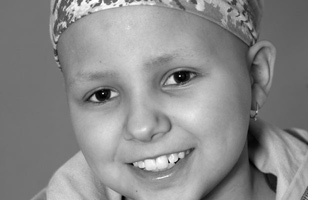 Aleena died on April 24, 2008, exactly four years to the day after her diagnosis. When she left our home for the last time we said goodbye not only to our daughter, but also to the cancer that had plagued our lives for the last four years. We donated her brain and spine to the University of Minnesota, where researchers are working on a vaccine for brain cancer. Everything was taken care of for us, and she was handled with the utmost respect and dignity. Seeing my beautiful daughter finally cancer free — though not in the way I had originally envisioned — was still comforting somehow. We feel that the decision we made to donate tissue is one that all families facing this journey should have the opportunity to make. Research needs to be done in order to find a cure. Tissue needs to be donated in order to do that research. The road we traveled is one no one wants to go down, but now that we have, we want to make sure that Aleena continues to leave her mark. Her donation may not be the cure, but it is a step. With enough steps that road eventually gets traveled. We don’t ask to take this walk, but if you are here as we were, please at least consider helping to add a step. It is a hard decision to make, I know, but in the end you will be thankful you did.